UPDATE: My call-in time has changed to 6:10 pm EST. 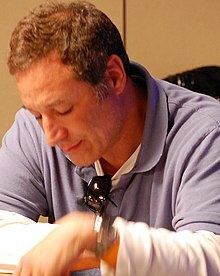 Tomorrow evening (Friday), at 6:10 pm EST, I’ll join Sam Simon to talk about orcas on his radio show on RadioIo. Simon is an interesting guy, who was “lucky” (his word) to be involved in getting The Simpsons up and running. He was also involved in a lot of other shows and you can read about him here. On the side of all this, and in addition to a radio show, Simon has a foundation, and does a lot of work protecting and rescuing dogs. SteveO, of Jackass fame, will also be on the show, to talk about circuses. If you want to listen in, the show will start at 6 pm EST, and I am calling in at 7 pm. Just go to this link, and click the red “Listen” button next to the “Bubba One” channel. Should be an interesting and unpredictable evening, so hope you can join in. ← Has SeaWorld Sorted Out Its Fast-Rising Pool Floor?